Two directors of the Amsterdam chamber of the Dutch West India Company, Samuel Blommaert and Samuel Godyn, bargained with the natives for a tract of land reaching from Cape Henlopen to the mouth of Delaware River. This was in 1629, three years before the charter of Maryland, and is the oldest deed for land in Delaware. Its water-front nearly coincides with the coast of Kent and Sussex counties. The purchase was ratified in 1630 by Peter Minuit and his council at Fort Amsterdam. The estate was further extended, on May 5, 1630, by the purchase of a tract twelve miles square (31 km²) on the coast of Cape May opposite, and the transaction was duly attested at Fort Amsterdam. The Dutch West India Company was formed to colonize the tract that included Blommaert, Godyn, Kiliaen van Rensselaer ( Patroon of Rensselaerswyck), Joannes de Laet (the geographer), David Pietersen de Vries and Mathijs Jansen Van Keulen. A ship of eighteen guns, The Walvis was fitted out to bring over the colonists and subsequently defend the coast, with incidental whaling to help defray expenses. A colony of twenty-eight people was planted on Blommaert's Kill (now Lewes creek), a little north of Cape Henlopen, and its governorship was entrusted to Gillis Hosset. This settlement antedated by several years any in Pennsylvania, and the colony at Lewes practically laid the foundation and defined the singularly limited area of the state of Delaware, the major part of which was included in the purchase. 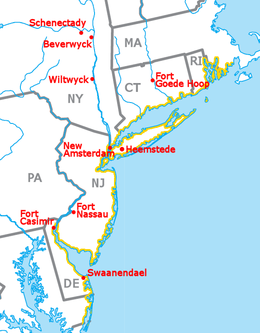 A palisaded fort was built, with the "red lion, rampant," of Holland affixed to its gate, and the country was named Swaanendael or Zwaanendael Colony, while the water was called Godyn's Bay (now Delaware Bay). A monument commemorating the colony named De Vries Palisade was dedicated on September 22, 1909 on the site of the former settlement. The Zwaanendael Museum was opened in 1931. ^ Bart Plantenga. (April 2001) " The Mystery of the Plockhoy Settlement in the Valley of Swans Archived December 21, 2010, at the Wayback Machine". Mennonite Historical Bulletin.